Cranberry Jell-O Salad - Home. Made. Interest. Dinner is the one time of day where everyone in the family stops what they are doing and we all sit down together. Even if it is just for 30 minutes it’s my favorite part of the day. I love to cook and I do it often but some days I just don’t have time to get everything done and I need a little help getting dinner on the table so I can enjoy some time with the family. Now that it looks like winter is here to stay pot pies are the perfect comfort food to warm us up, and on cold nights Marie Callender’s pot pies are one of my go-to quick meals for the family. They have a homemade gravy mixed with vegetables and your choice of meats, baked in a golden, perfectly flaky crust that’s made from scratch. Sawyer is always excited when I say it’s pot pie night! 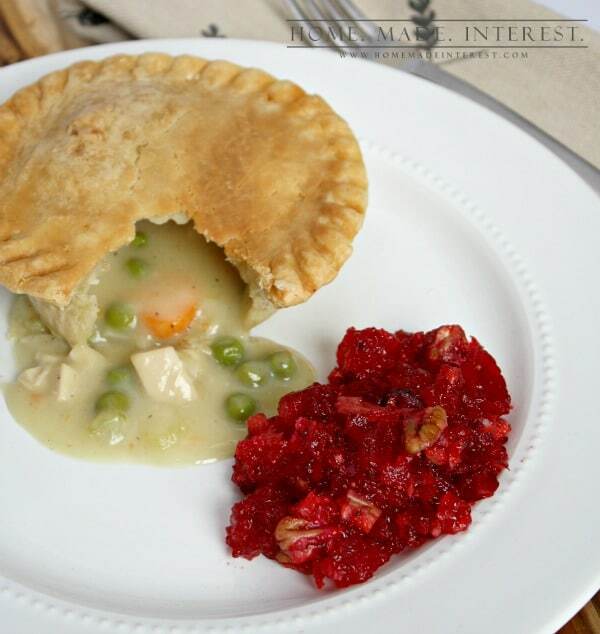 I love Marie Callender’s turkey pot pie and since the veggies are already cooked into the pie I like to make this simple cranberry gelatin salad to pair with it. I love it because I can make it a few days ahead of time and then serve it with the turkey pot pie on one of our busy nights during the week. 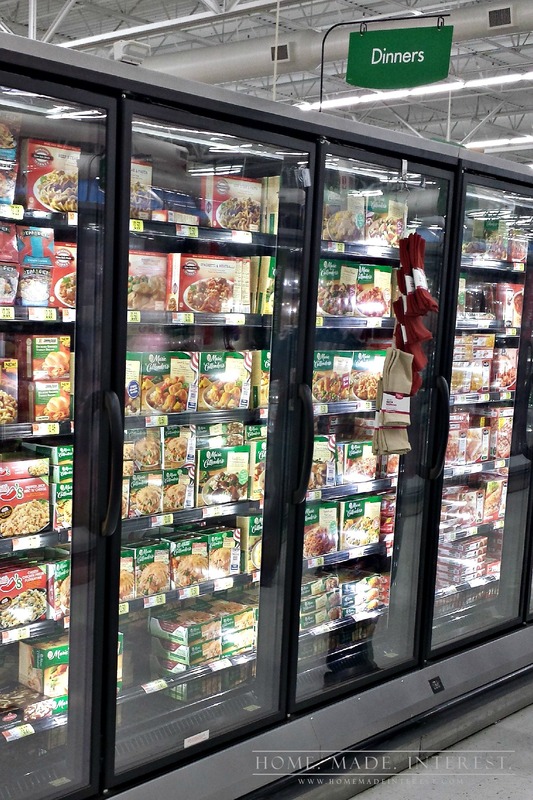 In one quick trip to Walmart and I can grab my Marie Callender’s pot pies and all the ingredients I need for the cranberry jello salad; fresh cranberries, 1 apple, 1 orange, pecans, 1 packet raspberry gelatin, and 1 package cherry gelatin. The recipe is easy you just chopped up the cranberries, apple, orange, and pecans in a food processor then add some sugar and let the mixture sit for at least 2 hours in the fridge. When the mixture is ready you boil some water and pour it into a bowl with the cherry and raspberry gelatin, stirring until it is completely dissolved. 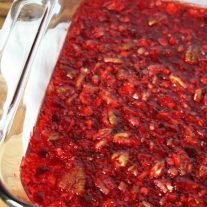 Then add the gelatin to the cranberry mixture, stir it all together and pour it into a casserole dish, or a gelatin mold if you’re super fancy. Cover it and let it set up over night. Done. You can make it on the weekend, or one of those days you aren’t crazy busy and keep it in the fridge until you are ready to serve it. 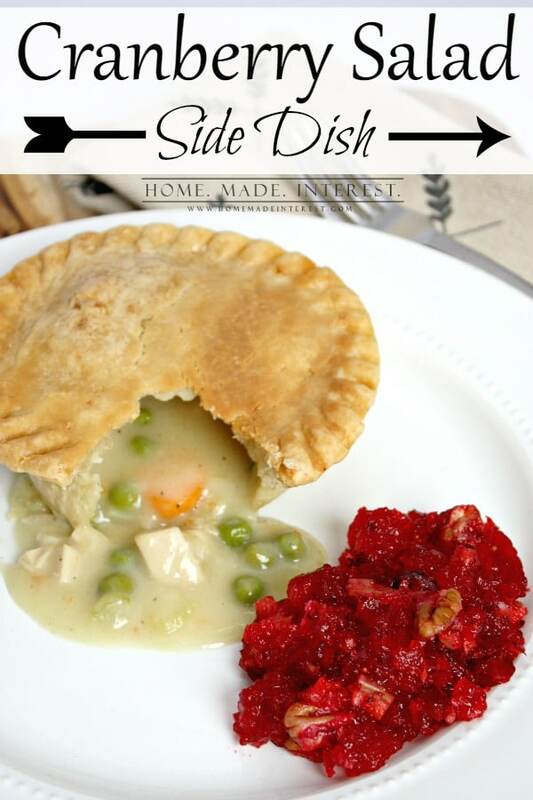 I love it with turkey pot pie because it gives dinner all the flavors of Thanksgiving without all of the work! It’s also great as a snack or, add a little whipped cream and ta-da! You have dessert. A simple gelatin salad with fresh cranberries, apples, oranges and pecans. Great for a dessert, side or snack. In a food processor, pulse cranberries with orange and apple until finely chopped. Remove mixture and place in a bowl. Pulse pecans in food processor until finely chopped. Stir pecans into cranberry mixture, ad sugar and mix thoroughly. Let mixture sit in refrigerator for 2-3 hours or overnight. Add both boxes of gelatin to the hot water and stir until completely dissolved. 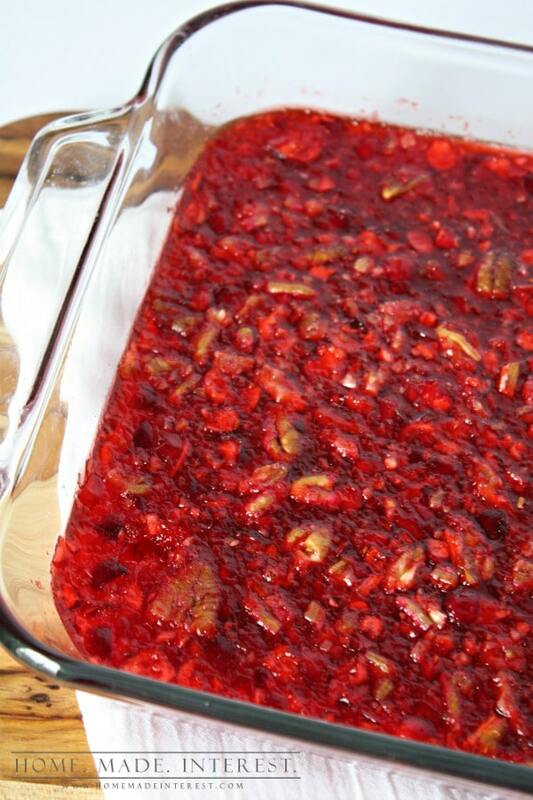 Pour gelatin into bowl with cranberry mixture and mix well. Pour gelatin mixture into a large casserole dish or gelatin mold. 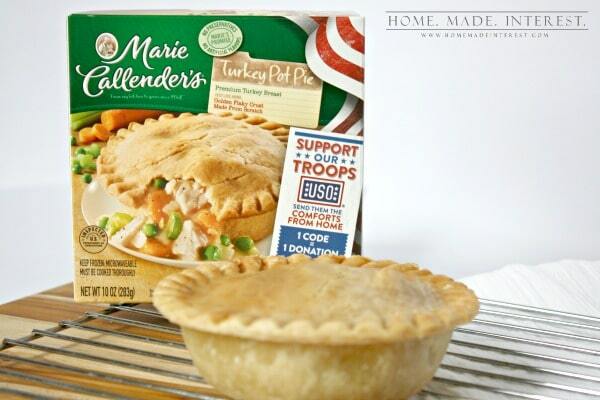 Marie Callender’s has also recently launched the Comforts From Home Project, a program dedicated to bringing the heartwarming feelings, flavors, and favorites of home to those who protect America’s homes every day: the brave men and women of the U.S. Military. I have several family members who are in the military and have had to spend extended time away from their families so this project is close to my heart. Every time you enter a code from a specially marked package of Marie Callender’s meals or desserts, Marie Callender’s will make a donation to USO2GO, a USO program that brings electronics, sports gear, books, games, and more to troops stationed in remote locations. 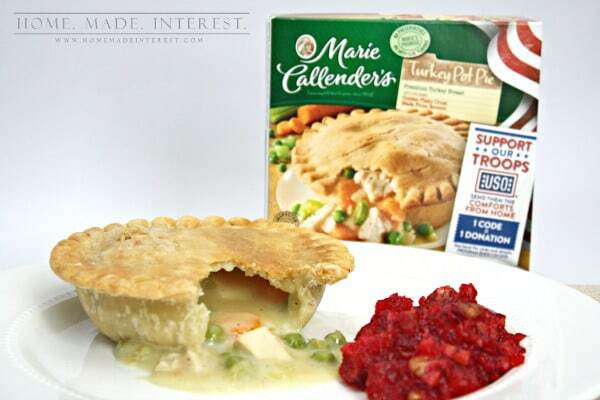 To find out more about Marie Callender’s go to http://www.mariecallendersmeals.com and then visit http://potpieplease.com for more great recipes. I never thought to make my own cranberry side dish. Thanks for the recipe. I actually do have fresh cranberries in my fridge right now. I baked some into muffins, which was really delicious, but I don’t know that I want to do that again before the remainder need to be used. It’s a great way to serve them…not too tart not too sweet! 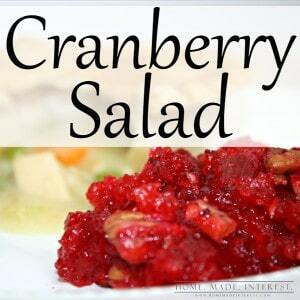 I have been searching for a cranberry salad recipe just like this one! Thank you so much for sharing it at Show Me Saturdays! Always happy to help. I hope you like it as much as I do! We are well and truly into the heat of summer now, but I can appreciate a good pie at any time. Lol…I am a pie addict!!! That cranberry salad certainly looks refreshing.